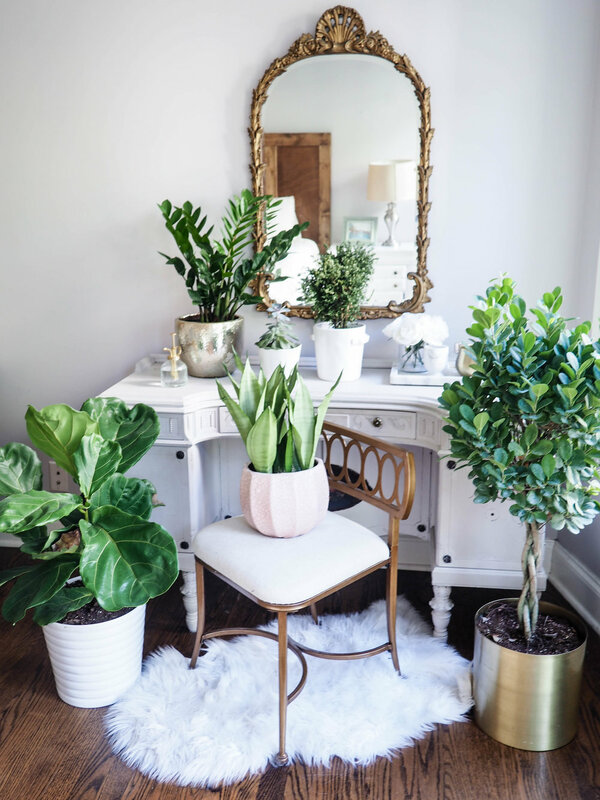 Having greenery in your home is like a breath of fresh air. Literally, it creates oxygen and purifies the air! 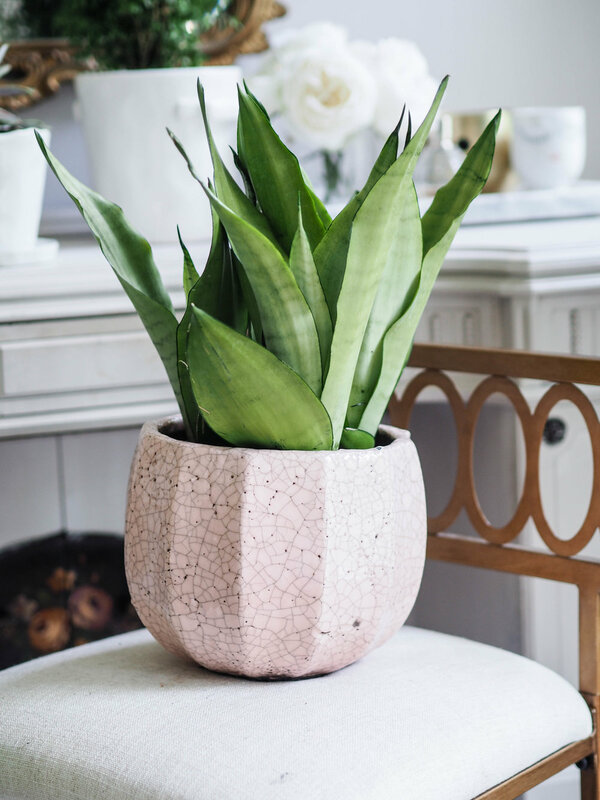 We thrive on the life plants give us, so why not bring them into your home? Especially with the warmth of the summer slipping away and the leaves of our precious parks falling to the ground. (That sounds really depressing, but winter is coming...) So, now is the time! 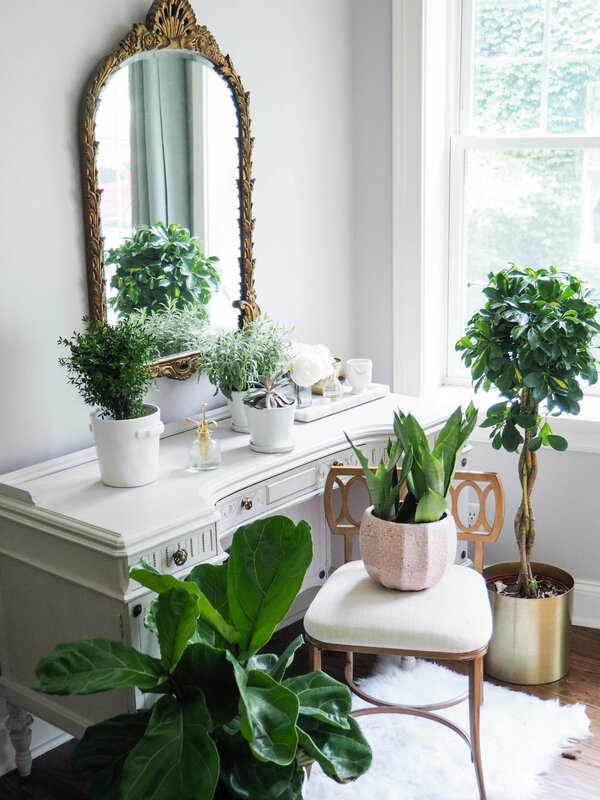 Indoor plants bring life, happiness, and color into your everyday so I'm putting one in each room! I'll start by saying I have NO green thumb. I've actually managed to kill all the plants I've owned... until now. These babies are here to stay! One, because our condo looks so much better with them and two, I can’t afford to keep replacing them. 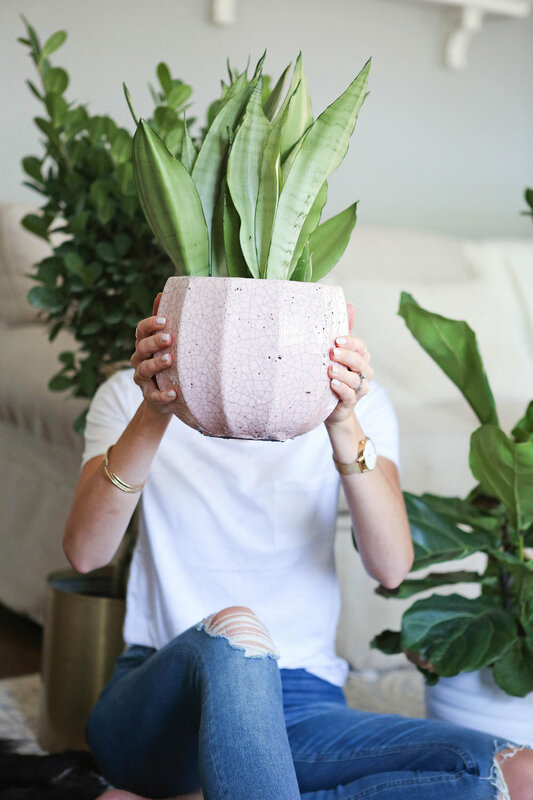 Plants can be pricey, but they don't have to be. You can always start with seeds and grow your own –if you aren't in a hurry– or do a little price hunting and buy in season. Our home is so much happier and complete with our indoor plants potted and in place! Adding a touch of joy to the morning light of our living room and vibrant life to my festive bar cart. The nursery should have been my first stop when we moved in! Also known as… a water-conserving warrior! If you leave town a lot or have a terrible memory (I'm guilty of both) this plant is for us! I watered it before I left for New York almost two weeks ago and the soil is still wet. I'm pretty confident I could neglect it for months and it would still be there to brighten my day. 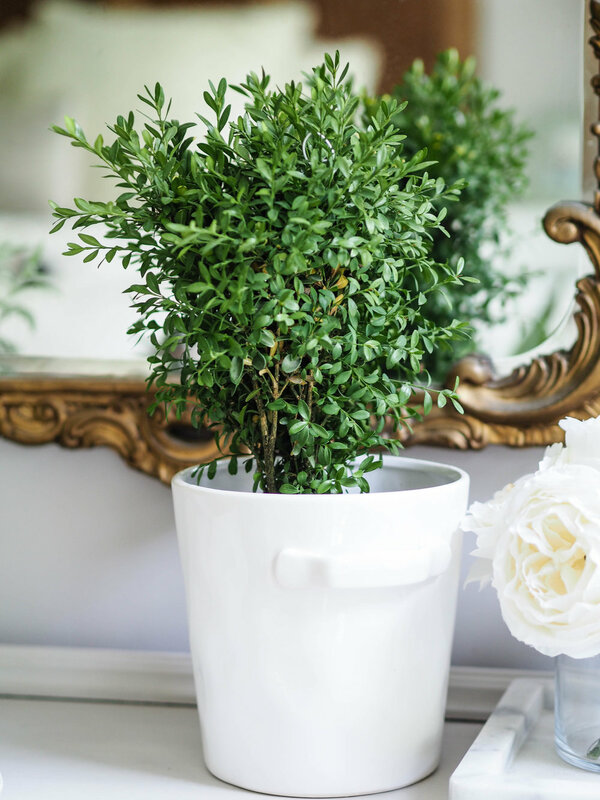 It comes in just about every size and works as a great way to add a little height to your décor. My pride and plant joy! I searched for this fellow for weeks, everywhere I called priced them at $90-300 and with my track record...I couldn't take that risk. Then Home Depot had a few for $20! He may be small but I plan on nourishing him to grow and flourish for years to come. It's actually an investment if you think about it; I bought it for $20 and years from now I could sell it for up to $900. Dreamy! I water once a week, when the soil dries out. The leaves need light so I rotate it at least once a week to make sure all the leaves get their dose of sunshine. Talk about low maintenance. The more I ignore my succulent the more it flourishes! I leave it on my windowsill (it does need a little light) and give it a few sprits of water to wet its roots a few times a month. I tend to be drawn to the cooler toned greens and these little leaves jumped out at me while I was browsing the whimsical collection at Old Town Gardens. Now it's in my living room and ties everything together! The shrub you can shape! I haven't pruned mine yet, but this pretty little plant can look however you like. It's the perfect way to dress up your shelves or tabletops. Layer the bottom of your pot with gravel for draining. Water when the soil starts to dry out on the surface. See here for pruning tips. This plant is a survivor! Something about its color and shape just makes me smile not to mention it's extremely tolerant and can live anywhere in your home, sunlight or not!